Blame undertaker Charles A. Clark the next time you circle block after block looking for a parking space. Think of him as you creep along bumper to bumper – in the rain, late for an appointment, with rude drivers honking at you and LOT FULL signs mocking you. Charles A. Clark is the man responsible for your frustration. 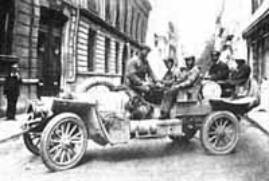 On January 4, 1900, Mr. Clark chugged into downtown Jacksonville in his brand new Locomobile, a Stanley No. 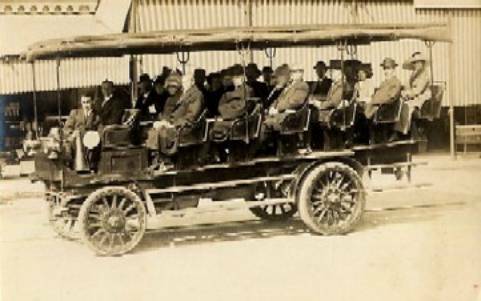 2 – the first factory-built motorcar in Florida. Our city has not been the same since. The Locomobile used bicycle tires on all four wheels. Instead of turning a steering-wheel, the driver pushed or pulled a long tiller to steer the car. The Stanley No. 2 sported a 5-horsepower steam engine. It weighed 450 pounds and cost $650. Mr. Clarke proudly showed off his contraption; he gave rides to a number of people. “All were delighted with the speed and simplicity of the invention. Several professional men announced their intention of duplicating the order immediately. Mr. Clark… has the assurances of several prominent people here that his lead will be followed by them as soon as the factory is able to supply the machine,” the newspaper said. Everyone in Jacksonville wanted to own a motorcar. Only three months later, another Locomobile, driven flat out on the beach by C.W. Seamans, a tourist, traveled three miles in only six minutes! “This is about as rare a thing as a shooting star in Purgatory,” said one newspaper reporter. The idea of motorcars really caught on. The first auto dealer in Jacksonville, Fred E. Gilbert, opened his garage and placed the first car ad in the newspaper on October 25, 1903. By the end of 1903, there were 40 motorcars in Jacksonville – enough for the city’s first Automobile Parade for the Gala Week & Trade Carnival. That same year enthusiasts founded the Jacksonville Automobile Club; a prime aim of the club was to promote good roads. On April 30, 1904, a prominent business man (he’s not named in the old records, but you want to bet it was Charles A. Clark himself?) was arrested and had to pay the city’s first traffic fine for speeding – the speeder exceeded the six-mile-per-hour limit on a downtown street thus endangering the lives and property of others. On April 3, 1905, F.E. Gilbert became the first person to drive from Jacksonville all the way to the beach. He drove a Victoria Touring Car and described his trip as “a terrible journey”. A 1910 motorcar on the road -- Dust, potholes, adventure. In 1906, nine automobile accidents happened in the city; three of these involved collisions with horses. On April 12th that year automobile races were held on the sand of Atlantic Beach and Joe Lander, of Atlanta, broke the existing world’s speed record for stock cars. 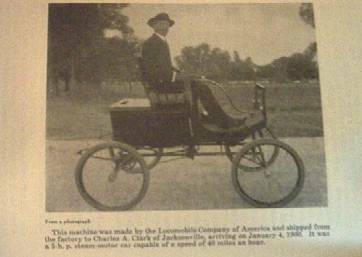 Driving a Thomas Motorcar, Mr. Lander raced down the beach for five miles in only four minutes and 55 seconds! That same year the Southern Automobile Manufacturing Company opened a plant at 913 East Bay Street. The factory assembled five cars a day. Their cars sold for $400 each. On January 10, 1907, Jacksonville celebrated a great public reception for Mr. Ralph Owen. 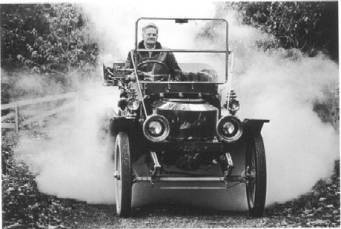 He accomplished the amazing feat of driving an Oldsmobile motorcar from New York to Jacksonville in only 15 days. His was the first through trip by automobile. On October 3, 1909, J.E.T. Bowden, a former mayor of Jacksonville, opened the city’s first taxi company with a fleet of 15 cars -- all Fords. One week later the cab drivers all went out on strike…. By April, 1910, Jacksonville streets were clogged by 903 cars; traffic was building. On July 28, 1910, a hundred gaily decorated cars moved in a parade through downtown streets, across the ferry, and out Atlantic Boulevard to the Little Pottsburg Creek bridge. There Miss. Marie Hyde smashed a bottle of champagne on the bridge rail to open that (mostly paved) road to the beach. (By 1922 drivers on Atlantic Boulevard complained about jarring potholes. One noted that Atlantic Boulevard was “a patchwork of repairs showing stretches of at least five kinds of paving materials… The road became entirely inadequate”). Car Thieves -- “When C.L. Pratt left his handsome touring car on the Hogan Street side of the First Baptist Church, he little thought that joyriders, (who) had designs on his machine, were at that moment lurking in the dark shadows of the house of worship to take possession as soon as the owner disappeared,” said the newspaper’s crime report. 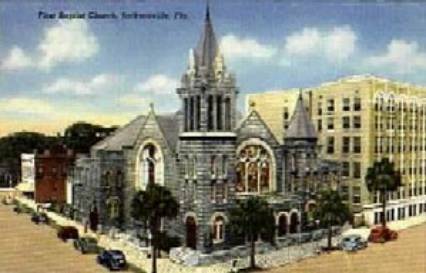 First Baptist Church, site of Jacksonville’s first car theft. Speeders – “Automobile speed fiends have been tearing things loose on Laura Street recently… The stretch of that thoroughfare lying between State and Phelps streets is being turned into a veritable speedway for cars of every description,” said the July 22, 1910 Times-Union. The town of South Jacksonville, which was a separate city in those days, increased their speed limit from 10 to 15 miles per hour to accommodate automobile owners that same July. Back on May 21st that year Charles K. Hamilton brought the first Curtis biplane to be seen in Jacksonville to an exhibit at Moncrief Spring Park. He raced his airplane against a Cadillac driven by Dexter Kelley. The airplane soared to a height of 2,500 feet and reached a speed of 60 miles an hour in a dive – but the Cadillac won the five-mile race. Beach Hazards – A newspaper report said that Dexter Kelly, “the well-known young automobile man, who owned the Cadillac that got caught Sunday” parked on the beach when the tide was low. But “a monster breaker came over the hard sand and caught the machine, holding the wheels as though in a vice. Another wave followed, and pretty soon the machine was submerged”. Early 1900s drivers loved to park on Jacksonville Beach at low tide. Over 50 cars stuck on Atlantic Boulevard! The volume of cars on city streets continued to grow. “The constantly increasing number of automobiles in use in Jacksonville makes their safe navigation of the streets a more difficult problem in proportion. Hundreds of motorcars are using the streets every hour of the day and far into the night. In most cases they are left to work out their own salvation…” said the June 25, 1911, Times-Union. But the crowded street conditions did not stop the city government from purchasing its own first motor vehicle --a truck for the Jacksonville Water Department – that same year. Yes, 1911 proved the automobile was clearly here to stay. Why, a group known as the Glidden Tour Drivers arrived here from New York and their trip had only taken 12 days of driving! 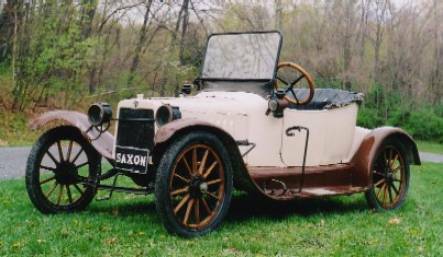 The Saxon Roadster at the 1916 Jacksonville Auto Show sold for $395. 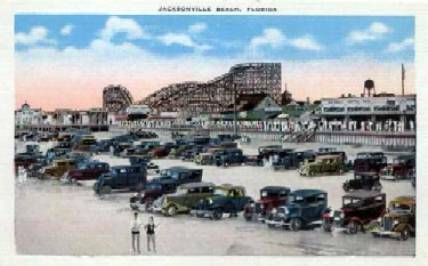 Jacksonville’s first Auto Show opened on March 6, 1916. It featured 29 different makes of motorcar ranging from the 7-passenger Cadillac Standard priced at $2,085 to the Saxon Roadster priced at $395. Dr. Benjamin Chapman joined the Duval County Medical Society in 1920. At first, the new physician could not afford an automobile so he rented a horse for 50 cents a day to make housecalls. When he was 95-years-old Dr. Chapman said, “Patients were poor. They would say, ‘Doctor, I haven’t got any money to pay but I’ll vive you a piece of ham and a half-dozen eggs now, and I’ll pay you later’. The people were always pretty good about paying you later”. Finally Chapman’s practice earned enough for him to buy his first car, a Maxwell. He ran out of gas on his first housecall. “When I bought the car,” he said, “Nobody told me I had to buy gas too”! When the Acosta Bridge, the first highway bridge across the St. Johns, opened on July first, 1921, close to 5,000 drivers paid the toll within three days. In 1924 historian and driver T. Frederick Davis lamented, “Within the last three years automobile traffic conditions have grown to be a serious matter, with dangerous smash-ups occurring almost daily, and fatal accidents of such frequency as to receive hardly more than passing comment from the general public”. During the early ‘20s Henry Ford spotted Jacksonville as a strategic place for the automobile industry; he build one of the largest factories in the Southeast here. In March, 1925, Ford opened his Model T plant in a building which covered over four acres under one roof. The three-story factory stood near the west foot of the present-day Mathews Bridge. 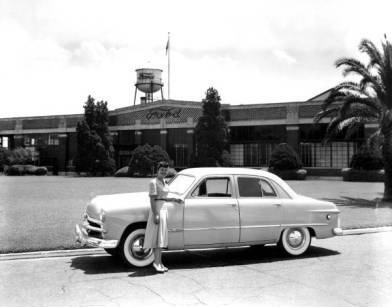 The Jacksonville Ford Factory employed 600 men who turned out 150 cars on every shift. From 1925 to 1928 the Jacksonville Ford Factory turned out 45,000 Model T Fords each year. From 1928 till 1932, the plant produced Model A Fords. Ships came upriver bringing parts to the docks at the plant; railroad locomotives loaded the finished black Fords and distributed them all over the country. Factory fresh from the Jacksonville Ford Plant (in background) about 1950. The Jacksonville Ford Factory continued in operation at the same site as a distribution center until the late 1970s. To keep traffic flowing Jacksonville inaugurated its one-way street system on Forsyth and Adams streets in 1937. 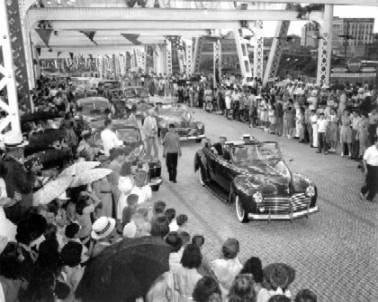 A parade in 1941 celebrated the opening of the Main Street Bridge. Still more cars poured into the city. And no place to park them! In 1942 Jacksonville’s first parking meters appeared on city streets. By 1987 nearly two thousand of them lined downtown curbs. Fines paid by drivers who wear out their quarter’s worth of welcome at the meters brought $750,000 into the city’s coffers. And over 90,000 citations were issued that year. By 1990 there were 7,844 more cars registered to Jacksonville owners than there were parking spaces for them!